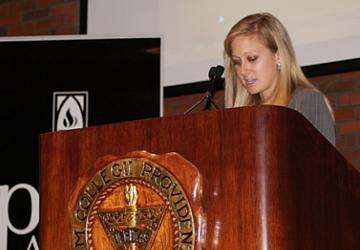 Last weekend I spoke at the 75th anniversary of my alma mater’s student newspaper, The Cowl. The coordinators of the event asked me to write about how my experience as editor-in-chief of the paper helped prepare me for my job as a journalist. I talked about this, but I also wanted to explain why it’s still worth going into journalism even despite all the turmoil the industry has faced. Not many students from Providence College go into journalism, but I wanted to encourage current Cowl staff members to give the profession a try and to be open-minded about nontraditional forms of storytelling. I felt grateful to have the opportunity to speak at the event and meet current and former Cowl staffers, and enjoyed spending time with them. About two dozen of us went into The Cowl office after the event and took part in what amounted to a journalism geek fest. We all crowded around old issues of The Cowl and reminisced about the stories we had written or the pages we had designed, getting overly excited about our time on the paper. The experience reminded me of the sense of community I felt whenever I put the paper to bed in that tiny Cowl office with others who cared about journalism. All those late nights were well worth it. As a follow-up to my speech (which I’ve copied and pasted below), my boss asked if I wanted to write a personal essay that would tie together the 75th anniversary of The Cowl and the 35th anniversary of The Poynter Institute, which both took place this month. I was having trouble finding a link between the two, so I started to write about my mom. Whenever I write personal essays, I find it easiest to start off writing about my mom, in part because doing so feels both comforting and familiar. I ended up writing an essay that tied together my mom, both anniversaries and my opposition (and eventual affinity for) the Web. I’ve gotten a lot of thoughtful e-mails this weekend from people who have said they related to the essay, which you can read here. Let me start off by saying that one of the best, and worst, parts about being editor of The Cowl was pulling all-nighters every Wednesday. The other staffers and I would edit and lay out stories until the wee hours of the morning, energized by the rush of working on deadline. The journalism nerd in us would come out in full force as we debated whether to use a four-column or five-column layout, or whether the serial comma was really necessary or just wasted space. Most Wednesdays, the associate editor and I would stay in that tiny, sometimes smelly, Cowl office — which was nicknamed the “windowless hovel” — until 4 or 5 a.m. every Wednesday. The importance of paying attention to detail is one of the many valuable lessons I learned while on The Cowl. Being editor also made me realize how rewarding — and challenging — it can be to lead your peers. Effective leaders, I learned, assess what needs to be improved and then set reasonable goals to see that these improvements are made. They reward staff members who are doing especially good work, and they take the time to train others who need their help. Perhaps most importantly, good leaders are never too proud to learn from others; they see their role as both a teacher and an avid learner. Being editor of The Cowl helped me gain confidence in myself as a leader and made me realize the power that student journalists have to give voice to the voiceless, hold the powerful accountable and reveal the truth. So often we hear about the importance of “veritas” at Providence College. The term couldn’t be more applicable to journalists, who help create a more informed society by seeking truth and sharing it with others. As St. John’s gospel notes, the truth will set you free. Having a willingness to change will keep you from getting trapped by antiquated conventions. Now more than ever, accepting change has become crucial to surviving — and thriving — in journalism. I realized the importance of change in journalism during my freshman year on The Cowl. At the time, Frank Caliva and other editors helped launch TheCowl.com. They created big promotional posters that said, “‘IT’S COMING!! :, hoping to stir up some excitement among those in the college community. Going online was a huge step for The Cowl because it showed that the paper was ready and willing to start experimenting with the Web. Campus newspaper websites provide student journalists with the opportunity to develop online skills, and they’re especially beneficial to alumni who want to stay connected to the paper from afar. But interestingly enough, for as plugged in as college students are, many prefer the print version of their student newspaper to the online version. We recently reported on this at The Poynter Institute and found that there are a few different reasons why this is the case: student newspapers are free, they’re easy to get a hold of, and they’re a tangible conversation starter. A spring 2010 study conducted by Student Monitor, a New Jersey company that surveys college students nationally twice a year about their reading habits, found that 56 percent of students surveyed say they don’t even know if their campus newspaper is available online. Interest in the print edition, though, remains high, with 63 percent of students classifying themselves as light or frequent readers of the print edition of the campus newspaper. For as happy as I am about the success of the print product on college campuses, I think it in many ways reflects the “bubble” of college life. In the journalism industry at large, the print product is suffering. This reality makes that little thing called change all the more important. When I was in college, I tried to avoid the changes in the industry. I was convinced that newspapers would always be people’s primary source of news and information. I was convinced that the Web was threatening the medium that I had wanted to work in all my life. Anyhow, at The Poynter Institute, I cover the media industry and regularly report on emerging trends and the intersection of journalism and technology. Reporting on this intersection meant I had to start using the tools I was writing about, and it forced me to start peeking over the wall I had built between myself and the Web. In writing about the media, I’ve found that the journalists who are succeeding are the ones who won’t settle for the argument, “Well, this is how it’s always been done.” Journalism is always changing and evolving; there’s no time to be afraid of experimenting with new ways of telling stories. Social networking sites and mobile technology have provided us with new and exciting opportunities to find story ideas, share content and reach new audiences. Newspapers have caught on to this, but they still struggle to remain relevant in a 24-hour news cycle. I’ll be honest and say that I don’t think newspapers will ever get back to the place where they once were — relevance wise or revenue wise. In recent years, newspapers have had to lay off staffs, consolidate their print product and close bureaus. Some newspapers have shuttered entirely. But there are plenty of signs of hope. News outlets are starting to hire again. Journalists are seizing these new opportunities, and in some cases, they’re leaving their full-time jobs at traditional news outlets to work for online news startups. They’re doing this, they’ve told me, because they believe these sites are integral to the future of journalism and they want to be part of that future. I can see their logic. Sites such as Politico, TBD, Salon, Slate and ProPublica (which won the Pulitzer Prize in 2009) have all emerged as credible news sources that rely on traditional values — truth seeking, ethics and a commitment to accuracy — but aren’t afraid to use social media and new tools to cover and share news. These sites, as well as some legacy print and broadcast outlets, are hiring younger people for newly crafted positions such as social media editor, community engagement director, and mobile manager. They see experimentation and risk-taking as an inevitable part of the job. The success of these new startups brings to mind a Semisonic lyric that Father Shanley quoted during his 2007 commencement speech: “Every new beginning comes from some other beginning’s end,” he said. (As a side note, I have to say I thought it was pretty cool that Father Shanley knew that song!) Right now, young journalists in particular have a chance to be part of something new in journalism. Even though parts of the industry are struggling, there are more opportunities than ever for all of you to help guide the future of the profession — online, on air and even still in print. As a young journalist, I’m optimistic about the future and am excited to be working in an industry whose fight for survival has paved the way for change and innovation. Embrace these changes, take the lessons you learned from all those late nights on The Cowl, and ask, “What have we been doing forever and how can we start doing it differently?” You might just be surprised by what you come up with. Great speech! I wish I could have been there to hear you give it. Three cheers to weekly all-nighters, chai and hot chocolate, the little man with his 3 a.m. popcorn gifts, various mid-day phone calls on Thursday from Keith and Andy, and all the craziness!